Control the list of domains to manage. There are several reasons to create a domain (tenant). One reason would be to organize customers and so customers have a unique login ie superadmin@domain.tld or superadmin@subdomain.domain.tld as the username. 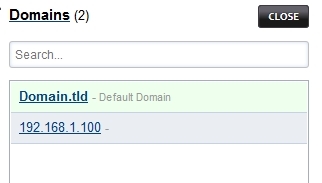 In this example we will create a domain. Goto advanced then click Domains. Click save once entry is complete. A menu will pop open on the right of the screen. Click on the domain that you want to manage. You will always see the domain you are in by looking at the top right beside the three stacked dashes.